Stem cell-based therapies are becoming increasingly common, especially in the treatment of blood cancers like lymphoma and leukemia. In these cases, the patient's cancerous blood stem cells are removed and replaced with new, healthy ones. However, up to a quarter of cases end in death because replenishing of blood cells is too slow. Scientists already know that stress causes HSCs to slow downreconstituting the entire blood-cell supply system can be overwhelming. In terms of biology, this stress causes increased activity in mitochondria, the energy-producing organelles of the cell. To meet the high demands of rebuilding blood cells, the mitochondria of the HSCs increase a process called "oxidative phosphorylation," which generates fuel for the cell. But this comes at a cost: Boosting the activity of mitochondria causes HSCs to age prematurely. The researchers found that exposing human and mouse HSCs to in vitro nicotinamide riboside improves their function and increases mitochondrial recycling, the process by which stressed-out mitochondria are cleared out to make way for fresh ones. They report that adding nicotinamide riboside to the diet of mice that had undergone an irradiation procedure that eliminates blood cellsmodeling radiotherapyimproved their survival by 80 percent and accelerated blood recovery. In immunodeficient mice, nicotinamide riboside increased the production of white blood cells (leucocytes). This represents a significant improvement in the ability of HSCs to divide and produce new blood cells. Nicotinamide riboside, or niagen, is an alternative form of vitamin B3, also called niacin. Like other forms of vitamin B3, nicotinamide riboside is converted by your body into nicotinamide adenine dinucleotide (NAD+), a coenzyme or helper molecule. However, the amount of NAD+ in your body naturally falls with age (3). Low NAD+ levels have been linked to health concerns like aging and chronic illnesses, such as diabetes, heart disease, Alzheimers disease and vision loss (1). Interestingly, animal research has found that raising NAD+ levels may help reverse signs of aging and lower the risk of many chronic diseases (4, 5, 6). Nicotinamide riboside supplements  such as niagen  have quickly become popular because they appear to be especially effective at raising NAD+ levels (7). Nicotinamide riboside is also found in trace amounts in cows milk, yeast and beer (8). May aid weight loss: Nicotinamide riboside helped speed up the metabolism of mice. However, its unclear whether it would have the same effect in humans and how strong this effect really is (23). May lower cancer risk: High NAD+ levels help protect against DNA damage and oxidative stress, which are linked to cancer development (24, 25). May help treat jet lag: NAD+ helps regulate your bodys internal clock, so taking niagen may help treat jet lag or other circadian rhythm disorders by resetting your bodys internal clock (26). May promote healthy muscle aging: Raising NAD+ levels helped improve muscle function, strength and endurance in older mice (5, 27). Nicotinamide riboside is likely safe with few  if any  side effects. In human studies, taking 1,0002,000 mg per day had no harmful effects (28, 29). However, most human studies are short in duration and have very few participants. For a more accurate idea of its safety, more robust human studies are needed. Some people have reported mild to moderate side effects, such as nausea, fatigue, headaches, diarrhea, stomach discomfort and indigestion (30). In animals, taking 300 mg per kg of body weight (136 mg per pound) daily for 90 days had no harmful effects (31). Whats more, unlike vitamin B3 (niacin) supplements, nicotinamide riboside should not cause facial flushing (31). I took Niacin for a couple of months and had so much energy I was pulling all nighters getting all kinds of work done. I moved fast, felt lighter, better. I ran out and a few months later I’m taking cat naps like I ordinarily do and trudging my way out in the morning. The difference really is pretty big. I’m going to order more once my next client pays up. "Nicotinamide ribosome is also found in trace amounts in cow's milk, yeast and beer"
How much beer would one need to drink to bring the level above 'trace'? Journal of Redox Biology Volume 17, July 2018, Pages 89-98 Nicotinamide riboside attenuates alcohol induced liver injuries via activation of SirT1/PGC-1α/mitochondrial biosynthesis pathway Highlights NR could reverse ethanol induced hepatic steatosis and oxidative stress. Boosting NAD+, NR enhanced mitochondrial functions by regulating SirT1/ PGC-1α. SirT1 played an important role in NR's protection against alcohol liver injuries. Nicotinamide riboside (NR) is a nicotinamide adenine dinucleotide (NAD+) precursor which is present in foods such as milk and beer. It was reported that NR can prevent obesity, increase longevity, and promote liver regeneration. However, whether NR can prevent ethanol-induced liver injuries is not known. This study aimed to explore the effect of NR on ethanol induced liver injuries and the underlying mechanisms. Results We found that ethanol significantly decreased the expression and activity of hepatic SirT1 and induced abnormal expression of enzymes of lipid metabolism in mice. Both in vivo and in vitro experiments showed that NR activated SirT1 through increasing NAD+ levels, decreased oxidative stress, increased deacetylation of PGC-1α and mitochondrial function. In SirT1 knockdown HepG2 cells, NR lost its ability in enhancing mitochondrial function, and its protection against lipid accumulation induced by ethanol. 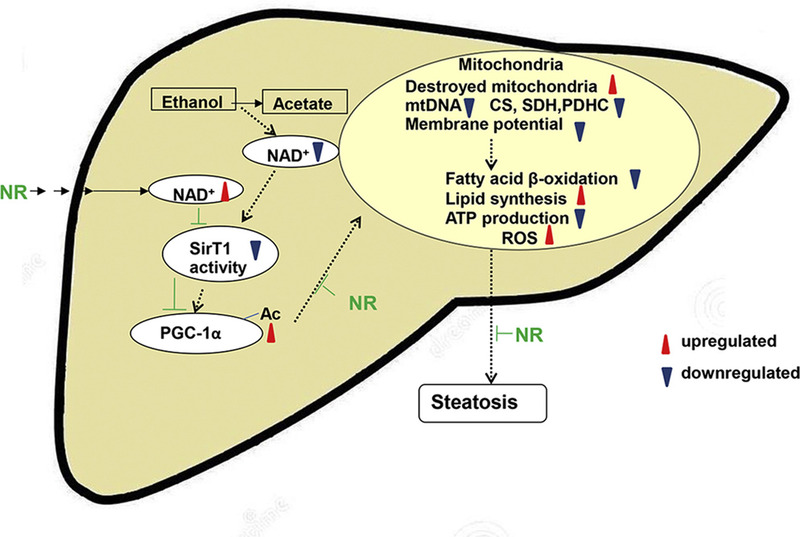 Conclusions NR can protect against ethanol induced liver injuries via replenishing NAD+, reducing oxidative stress, and activating SirT1-PGC-1α-mitochondrial biosynthesis. Our data indicate that SirT1 plays an important role in the protection of NR against lipid accumulation and mitochondrial dysfunctions induced by ethanol. NR could reverse ethanol induced hepatic steatosis and oxidative stress. Boosting NAD+, NR enhanced mitochondrial functions by regulating SirT1/ PGC-1α. SirT1 played an important role in NR's protection against alcohol liver injuries. Nicotinamide riboside (NR) is a nicotinamide adenine dinucleotide (NAD+) precursor which is present in foods such as milk and beer. It was reported that NR can prevent obesity, increase longevity, and promote liver regeneration. However, whether NR can prevent ethanol-induced liver injuries is not known. This study aimed to explore the effect of NR on ethanol induced liver injuries and the underlying mechanisms. Results We found that ethanol significantly decreased the expression and activity of hepatic SirT1 and induced abnormal expression of enzymes of lipid metabolism in mice. Both in vivo and in vitro experiments showed that NR activated SirT1 through increasing NAD+ levels, decreased oxidative stress, increased deacetylation of PGC-1α and mitochondrial function. In SirT1 knockdown HepG2 cells, NR lost its ability in enhancing mitochondrial function, and its protection against lipid accumulation induced by ethanol. NR can protect against ethanol induced liver injuries via replenishing NAD+, reducing oxidative stress, and activating SirT1-PGC-1α-mitochondrial biosynthesis. Our data indicate that SirT1 plays an important role in the protection of NR against lipid accumulation and mitochondrial dysfunctions induced by ethanol. I’m taking 2000 mg/day of niacin to reduce cholesterol (I get muscle aches from every statin on the market, and niacin is cheaper) I wonder if nicotinamide riboside will also reduce cholesterol? Oh, please. More manufactured garbage. The US patent holder purchased it from several universities and designed a chemical manufacturing process for concentrating the molecule from cow’s milk. All other forms are mostly Chinese made copies and utilize a process which involves some rather nasty solvents and counterfeit products have been found to be adulterated with toluene. Drink beer, live longer. Cheers! Folks really need to get a grip, take responsibility and stop looking for the magical Unicorn (a magic pill that cures everything). If your triglycerides are a reasonable portion on your cholesterol number, those come directly from carbsespecially sugars and breads. Get rid of those and that number will go down. Check your A1C. If high, you have a lot of carbs AND few antioxidants. Everyone taking statins really needs to take CoQ10 or the better form called ubiquinol. Your doctor should have told you this, sadly. It will blunt most pain-related issues from statin use (CoQ10 production in your body goes way down with statin use). Last A1C was 6.9, working on getting it a bit lower. Thanks for sharing the CoQ10 data. Just last evening I advised a friend to see his Dr and get an A1c test as he has been having serious memory problems. If the hemoglobin are sugar coated they have less ability to carry oxygen to the brain and decreased ability to remove CO2. Makes me wonder if that is a causal influence on peripheral neuropathy associated with diabetes.